SBC issued to direct labor is allocated to cost of goods sold. SBC to R&D engineers is included within R&D expenses. SBC for management and those involved in selling and marketing is included in SG&A and other operating expenses. 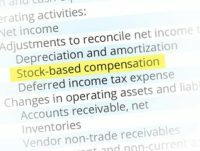 The consolidated income statement will often not explicitly identify SBC on the income statement, but it's there, inside the expense categories. In fact, footnotes in financial filings will often detail the allocation by expense category. There are two prevailing forms of stock based compensation: Restricted stock and stock options. GAAP accounting is slightly different for both. We'll start with an example with restricted stock and then proceed to stock options. 1The unearned compensation account is simply a contra-equity account to make the balance sheet balance. It will be reduced as the employees earn their awards. 2Calculated as [300,000 shares * $10 per share]. First, notice that nothing really happened. An equity account was created and was exactly offset by a contra-equity account. Also notice that there is no income statement impact and no stock based compensation expense has been recognized yet. It will only be recognized once it's earned (i.e. vested). Also notice that the value of each share of restricted stock recognized by Jones Motors on its balance sheet is equal to its current share price. That's not the case with stock options as we'll see shortly. The same thing will happen on January 1, 2020 and again one final time on January 1, 2021. Common stock and APIC is impacted immediately by the entire value at grant date but is offset by a contra-equity account, so there is no net impact. The value recognized for each restricted share is the same as its current share price (for non-dividend paying stock). We now turn to the accounting and journal entries for stock options, which are a bit more complicated. The exercise price of the options is $10 per share. Jones Motors current share price is $10 per share. The fair value of each stock option is determined by Jones Motors to be $5 using the Black-Scholes option pricing model. The stock options will vest over 3 years: 33% on January 1 of each over the next 3 years. Nothing happens at the grant date. Unlike restricted stock, there are no offsetting journal entries to equity at the grant date. The stock options do not impact the common stock and APIC balance at the grant date. 1Calculated as 300,000 shares * $5 per share. This is an expense recognized on the income statement. It reduces retained earnings. Jones Motors share price on the exercise date (January 2, 2021) is $20 per share. 1Calculated as 900,000 shares * $10 per share. 2Calculated as 900,000 shares * $5 per share. As options are exercised and become common stock, the APIC - Stock Options account is reversed and transferred into this Common Stock & APIC - Common Stock account below. Notice that the net increase to equity on the balance sheet at the exercise date is simply the amount of option proceeds. When building financial statement models, the fact that there is actually a transfer from the APIC - Stock Options account to the Common Stock & APIC - Common Stock account is ignored and only the net effect is modeled. Notice also that the market price of Jones Motors stock price is irrelevant in the journal entries. So far, we have described the GAAP accounting treatment of stock based compensation. In practice, many analysts actually ignore the stock based compensation expense entirely when calculating EPS or when calculating EBITDA or when valuing companies . We discuss the wisdom of these approaches separately in those individual articles.